With this capability, you can automate the many routine tasks that you perform, freeing up time to focus on analyzing the results. You can choose from a variety of industry standards such as .NET, PowerShell and scripting languages such as VB Script, to communicate with AdminStudio, so you can use the method most familiar to you. 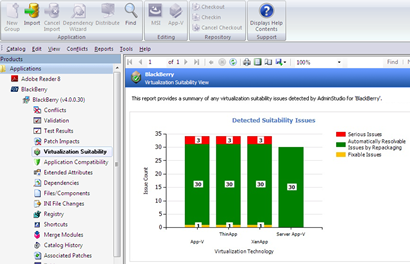 AdminStudio Enterprise Edition includes InstallShield 2012 Premier to simplify the configuration of multi-application software installations, eliminating deployment issues and reducing support costs for application suites. Accurate identification of deployment metadata is crucial for populating Microsoft System Center 2012 Configuration Manager new application model. AdminStudio automatically gathers this metadata by mining package elements such as detection methods, requirements, and dependencies. All of this metadata, which you can easily view and edit in AdminStudio, is transferred directly to Configuration Manager upon application publication. AdminStudio maintains the applications in an easy-to-navigate Application Catalog, providing a tree-view of the catalog that displays all available applications and the deployment formats available for each application. 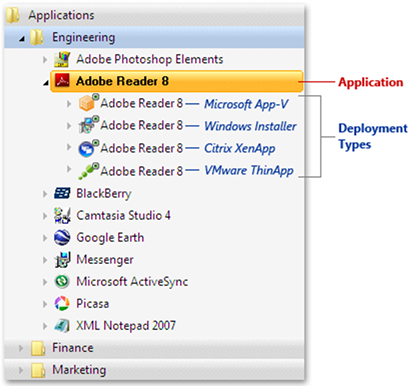 This view shows, at a glance, the applications included and what deployment types are available for each application. This greatly simplifies management of the applications. Application Manager's Import Wizard now offers a new option on the Select Package Source panel to perform a bulk import of applications from Configuration Manager 2012, while maintaining its support for package import from earlier releases of Configuration Manager. If you select the "Show only good candidate packages (MSI)" option, AdminStudio will check the packages in the Microsoft Configuration Manager 2007 server to determine if they are good candidates for migration to Configuration Manager 2012, and filters the list accordingly. Filtering speeds the adoption of Configuration Manager 2012 by enabling you to quickly identify and migrate good candidates before moving on to those that require more work. AdminStudio performs automatic suitability testing of packages for Microsoft® Server App-V. By identifying conversion issues in advance, AdminStudio allows users to focus first on those applications that lend themselves readily to the Server App-V environment. This speeds the conversion process and helps to accelerate the adoption of Server App-V technology. Detects ASP.NET and /or IIS applications—ASP.NET and IIS applications are supported by Server App-V, but fail for App-V, ThinApp, and XenApp. Detects WMI provider applications—WMI provider applications are supported by Server App-V, but fail for App-V, ThinApp, and XenApp. Detects J2EE server applications—J2EE server applications are not supported by any virtualization format. Detects unsupported applications (error category)—Looks for files matching a black list, such as files associated with Symantec, McAfee, and Exchange Server. These applications are not supported by any virtualization format. Detects unsupported applications (warning category)—Looks for files matching a black list, such as files associated with SQL Server. A warning is generated for all virtualization formats. When you import an application package into the AdminStudio Application Catalog. NOTE: The first time you open an Application Catalog database from an earlier release of AdminStudio, you have the option to re-import all of your MSI packages and automatically create software tags for them all. When you convert a legacy package to a Windows installer package. Automatic tagging eliminates the need to manually tag each application, a time-consuming and error-prone process. You can view and edit the tag file information for each application using a new, easy-to-follow view,so you can tell at a glance the tagging status of each application. In this way, you can ensure that all applications have comprehensive and accurate tags to enable effective application asset management.